We would like to say a huge congratulations to Mark Hardcastle, who used Instructors Directory to find a qualified driving instructor, and who recently passed his driving test! Mark Hardcastle discovered Mark Easter from SLK Driving School, who is based in Blackpool. However, SLK operate throughout Lancashire. 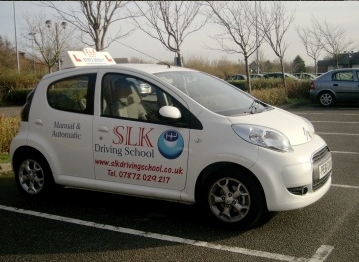 Rated five stars on our directory, SLK offers friendly and professional driving lessons to learners of all ages and levels. Mark also offers refresher lessons to drivers with a full license who haven't driven for a while or are afraid of motorways, training in Pass Plus and Disability Driving lessons. Mark will also work with you to learn and practice theory. In fact, Mark and SLK offer one superb service! And we are pleased to say that as well as having great things to say about SLK, Mark Hardcastle also left a road raving review for Instructors Directory! “I would just like to drop a few words, just to say that Instructors Directory solved all of my "which instructor should I choose" dilemma's. I found the absolutely perfect Driving Instructor Mark Easter, with SLK Driving School and I am excited to say that I am now a fully qualified driver. The directory is easy to use and very helpful and I would recommend it without hesitation. Thank you very much Instructors Directory!" You’re more than welcome Mark, and we wish you happy driving! Looking for your perfect driving instructor? Why not visit SLK’s website www.slkdrivingschool.co.uk for further information. Not in your area? Not to worry! We have several driving instructors throughout the UK waiting for your call! Use our targeted search engine to find your perfect match! Do you have a success story because of Instructors Directory? We would love to hear from you - both instructors and students! Please email mark@instructors-directory.co.uk to get in touch!